From the Hancock County Courthouse, go west on Hwy 22 for 0.2 mile and turn right on Dixie St. Go 0.6 mile to a fork. Bear left onto James Hunt Jr. / St Mark Church Rd. The church is 0.1 mile ahead on the right. The cemetery is behind and to the left of the church as you face its front. The oldest part of the cemetery is in the woods. This area is approximately 3 acres with many unmarked sunken graves and cement slabs. The newest part is closer to the church. Graves numbered 300 or higher have been added based on obituaries since the original survey and are believed to be located somewhere within the cemetery. 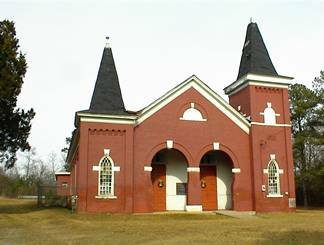 This historical church was founded in 1867, and the church was rebuilt in 1893-1901. Age 70 years. w/o Petro Wynn. "Earth hath no sorrow that Heaven cannot heal"
No dates. A recent grave as of December, 30, 2002. Name from floral arrangement. A recent grave as of December 30, 2002. "Beloved husband, father, and brother"
Purple Heart SGT U.S. Marine Corps. Board with name hand lettered. Name spelled "Lawerance" but correct spelling probably "Lawrence". Marker deteriorated and not readable. No dates visible - may be below ground. Iron metal vault - unmarked. Middle name spelled with "d" and "g" reversed from normal spelling. Ingram Brothers Funeral Home marker. "Our Father, which art in heaven." On same gravestone as Verna Belle Barnes. On same gravestone as Jesse Barnes. Georgia PVT Co F 4 QM Tng Regt. Age 89. All info per funeral home marker. Marker appears to have been moved from original spot. "He is not dead but sleepeth." Stone broken at first letter of last name. "May the work I've done speak for me. Rest in peace." Hand lettered on stone. Concrete post with "W" on top and "P" on side may indicate grave. 3 slabs in the gulley. Masonic emblem. "Uncle Joe" "You made our life truly 'lovely'"
Age 99. All info per funeral home tag. "Jesus is Lord" "Beloved daughter, mother, and grandmother"
"There is a Life above, And all that life is love." "We love you, Grandma GG." Eastern Star emblem. "We thank you Sam-Sam for everything." "Every joy to us is dead since Mother is not here." Death year difficult to read. Enclosed in a wire fence with at least 2 unmarked adult graves. d/o Jim and Rachel Potter. "He followed virtue as his truest guide, Lived a Christian, As a Christian died." w/o Tobe Langleng. "Another link is broken in our household band, But a chain is forming in a better land." "Not lost, blest thought, But gone before, where we shall meet, To part no more." "Not lost, blest thought, but gone before, where we shall meet." Georgia Cpl 425 Res Labor BN QMC. Possibly more graves in the thicket too dense to penetrate. No death date as of December, 2002. Age 40. Not found in 2002. All info per Kimbrough. Not found in 2002. Name per Kimbrough. "Miss" Not found in 2002. Name per Kimbrough. Age 37 years. Not found in 2002. All info per Kimbrough. Not found in 2002. Name, dates per Kimbrough. Birth year corrected by gr gr niece, Shaundra Walker. All info per Rev. Donna Butts. Grave not found in original survey. Info per Rev. Donna Butts. Grave not found in original survey. 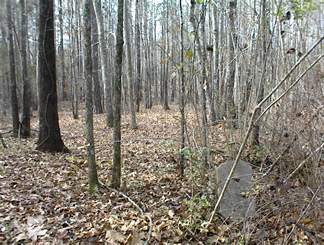 This old part of the cemetery in the woods is estimated to have in the neighborhood of 200 unmarked graves or slabs. The marked graves above are scattered throughout. Alexander "Sam" Battle , Sr.
Eddie E. Battle , Sr.